As a cameraman Michael Ballhaus made cinema history. On 12 April 2017 he died in Berlin at the age of 81 years. At the 2016 Berlinale he was awarded an Honorary Golden Bear. At that time, goethe.de interviewed the native Berliner about his extraordinary career. Mr. Ballhaus, at the International Film Festival in Berlin (the Berlinale) you are to be awarded an Honorary Golden Bear for Lifetime Achievement. What does this accolade mean to you? It really means a lot to me, because I have felt connected with the Berlinale for 40 years. I was always thrilled when one of my films was shown at the festival. For me the award is, so to speak, the crowning glory of my involvement with the Berlinale. You are the first cameraman ever to receive this prize. Compared to actors and directors, cameramen seldom enjoy the limelight in Germany. With you it is different. Was there a point in your career when you realised that your work was being appreciated by a broader audience? I think it all started back in the 1980s when I made a few films in America with Martin Scorsese and other notable directors. When a German gets to work on a film in the States, it really means something. And back then there were not so many Germans who were able to embark on a career like that in the American movie business. In your autobiography, “Bilder im Kopf” (Images in the Head) you write that as a child you hardly saw any films. Your parents were stage actors and they set up a small theatre, where you then started to work as a photographer. Was it that theatre that gave you an important impetus for your later work? That was most definitely the case. It was in the theatre that I learned how important the profession of an actor is and how sensitively actors have to be handled. The huge respect I have for the acting profession plays a major role in my work, because the actor also feels this when he is in front of the camera. You decided you wanted to become a cameraman after you had been on the set of Max Ophüls’ film “Lola Montez” (1955), one of the most extravagant films of the 1950s. You immediately did a course in photography and worked for several years as a television cameraman. At the end of the 1960s you made your first cinema film and you even did a bit of lecturing at the Deutsche Hochschule für Film und Fernsehen (German academy of Film and Television) in Berlin. You yourself, however, have never studied filmmaking. No, my film school was the cinema. From a certain point in time onwards I went to the cinema all the time. There was many a film I watched over and over again – Jean-Luc Godard’s Contempt, for example, I saw eight times, I’m sure. There were so many great things in it that I simply had to try and find out how the cameraman, Raoul Coutard, had done it. Another one of my role models was Sven Nykvist, Ingmar Bergman’s cameraman. He had the gift of photographing people’s eyes in the most beautiful way. For me eyes have always been something very important – the windows of the soul. Working with Fassbinder – that was a tough school, but a good one. I learned so much. Above all one thing – if you can get along with Fassbinder, you can get along with any director. Yes, he was what you might call a little difficult …. For Fassbinder’s film, “Martha” (1974) you invented the famous 360-degree circle shot that has gone down in film history as the “Ballhaus Kreisel” (the Ballhaus spinning top). Even your early films were characterised by elegant camera moves. The movements a camera goes through were very important to me right from the start. I am very much a fan of the slogan “motion is emotion”. When you move the camera, you stir emotion in the audience. You have worked in the United States since the beginning of the 1980s. To what extent were you perceived in America as a German cameraman? You made seven films with Scorsese, among them the gangster movies “Goodfellas” (1990), “Gangs of New York” (2002) and “The Departed” (2006). Is there any film you are particularly fond of? Yes, there is one – The Age of Innocence from 1993. It is actually my favourite film, too. I really like this kind of emotional story. We had a very good screenplay and wonderful possibilities with fantastic actors like Michelle Pfeiffer, Winona Ryder and Daniel Day-Lewis. The locations and sets were a dream. We would never have been able to shoot something like that at that time in Germany. The film is extremely lavish and staged in a very precise way. Yes, like Fassbinder, Scorsese is also a very visual director. His ideas on how to shoot a scene are worked out very precisely. And for me it was an absolute joy to realise those ideas. Nevertheless, there is always a huge difference in the way an image is described and the way it is turned into reality. That, too, was a very interesting film for me. The director, Steve Kloves, was in fact not a visual director at all. After I had read the screenplay, I told him my ideas on how I saw the film. He simply answered, “Then do it like that, do it like that!” I had complete freedom on how to shoot the scenes. And, of course, I was very pleased about that. There is a magical moment in the film when the camera does a circle shot round Michelle Pfeiffer, who is lying on a grand piano and singing. That 360-degree circle shot round Michelle … When I read the screenplay I knew – it had to have the effect of the sexual act – the camera had to do one complete circle round her. I suggested it to Steve and he was thrilled with the idea. Michelle did a splendid job and it became one of the highlights of her career. You have worked with many of the great directors, people like Francis Ford Coppola, Volker Schlöndorff and Wolfgang Petersen. Have you never thought of directing a film yourself? I did in fact once find a story that I was very interested in – the life of Lotte Lenya, the Austrian singer and actress. I pursued the project for quite a few years, but then in the end it was a German television editor that brought about its end. Whatever, I have still made a lot of wonderful films. The Age of Innocence for example, but today I do not think any studios would be interested in producing a film like that. I was fortunate enough to be a cameraman in a time when the realm of cinema was teeming with content. 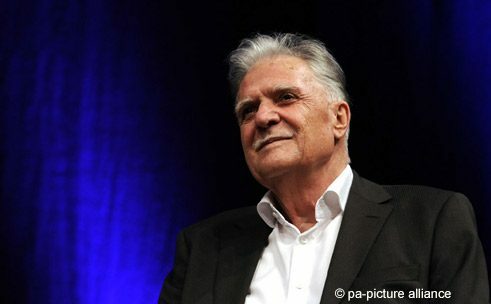 Editor's note: The interview with Michael Ballhaus was conducted in January 2016.